In a way, I think it's funny that I bought an Xbox 360 instead of a PS3 just over a month ago, as there are many more PS3 games--including 3D Dot Game Heroes, Afrika, Disgaea 3 and 4, Siren: Blood Curse and Valkyria Chronicles--on my "to buy" list than there are Xbox 360 ones. That situation was made even funnier last week thanks to a few rather scrumptious PS3 game announcements and releases. 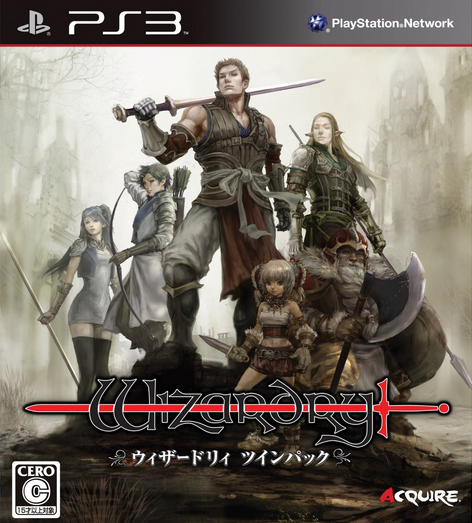 Case in point: The PSN release of Wizardry: Labyrinth of Lost Souls. Full disclosure: I've never played a Wizardry game before. Hell, it's worse than that: I know next to nothing about this hallowed series of dungeon-crawling RPGs. 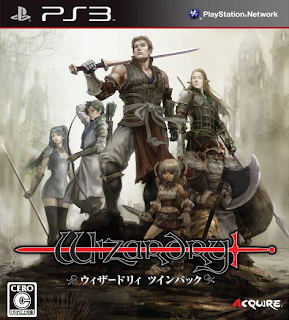 That said, I want to play Wizardry: Labyrinth of Lost Souls. Badly. Desperately. Why? Well, although I know it's a bit superficial of me, but I really like how it looks. Also, it reminds me of Etrian Odyssey--although I realize this game is quite different from that DS release. Really, all of the above is just my long-winded way of saying I (still) want a PS3. Of course, I also want a Master System (or maybe a Mark III), a PC Engine LT, a Saturn and a Sega CDX. I guess I'd better win the lottery soon if any of that's going to become a reality, eh? I think you'd like 3D Dot Game Heroes as well, as you have the retro knowledge to get all the jokes! And Valkyria Chronicles is just a wonderful game, must-play. Here's hoping you can snag yourself a PS3 at some point to enjoy all it has to offer! The 360 is great and has lots of wonderful indie games and exclusives, but it just seems like even though so many games are multiplatform now, those exclusives hold just as much power over us as ever. Yeah, I have to imagine I'd like 3D Dot Game Heroes and Valkyria Chronicles. Do you have either of them -- or have you played them? I'll get a PS3 eventually, I'm sure. I'm OK with waiting, really -- especially since I'd rather it cost $199 than $299. The longer I wait, the more likely that is to happen! Yeah, I own both! Valkyria Chronicles is a great-looking Strategy RPG with lots of interesting characters to send out to battle. I loved the real-time movement and attacking combined with your usual SRPG strategic planning. Oh, and tanks! Tanks are fun. But you're right, it's best to enjoy what you have right now! That way whenever you do get to snag a PS3, you'll be able to dive in to all those games without ignoring the others. Thanks for reminding me that I need to get this. There always seems to be a crazy-huge amount of stuff that I want -- so I often forget from one week to the next! I think I'll pass on buying the portable Dreamcast, and use the money I saved to get this instead. You remind me that I'm still waiting to hear back about possibly getting a review copy of the new Wizardry game... I'm kind of expecting it won't happen though haha. And if it does I'm kind of screwed because I'm really horrible at these games, but love trying to play them anyway. As for wanting so many consoles, you're not alone there! I hope you might be able to snag a PS3 in the next few years though. For "multimedia" capabilities the PS3 really is my favorite console for the current gen (especially since you don't have to pay for so many extra services like on the 360). Also, I love this comment of yours: "That way whenever you do get to snag a PS3, you'll be able to dive in to all those games without ignoring the others." Very true!! Hey there, Zigfried! I'm glad I was able to remind you of Wizardry. Tell me what you think of it after you've had a chance to play it, will you? Anne: The Silent Hill HD release will include the second and third games in the series, as far as I'm aware. So, it sounds like it might be a good purchase for you. Marcus: I really don't understand why the Silent Hill collection doesn't include all four games. OK, I guess the first one might be hard to upscale, but the fourth? I guess it just wasn't popular enough? Still, why not give people the opportunity to play it? You and I are so alike, Bryan! I've never really played the Silent Hill games either because I'm too scared. I think I rented 2 once to try it out (I believe it was 2, don't know for sure), and I got so scared I returned the game before I even fought my first enemy (that atmospheric stuff is the worst! I watched my husband play the Dead Space games fine). I've actually heard that most SH fans *hate* 4 and don't really consider it part of the series. I think I just read that it's coming here in Sept., too, Anne, although you probably shouldn't quote me on that. Also read that it'll be $39.99, which seems like a good deal to me! It does sound like we're pretty similar, doesn't it? :) I'd deal with survival horror games a lot better if they had more normal/traditional controls, I think. The tank controls in the old RE games, for instance, just ruin the experience for me. Oh, well, I'll have to try them and the Silent Hill games again sometime soon. As for playing them "together" sometime, I'd definitely be up for that!